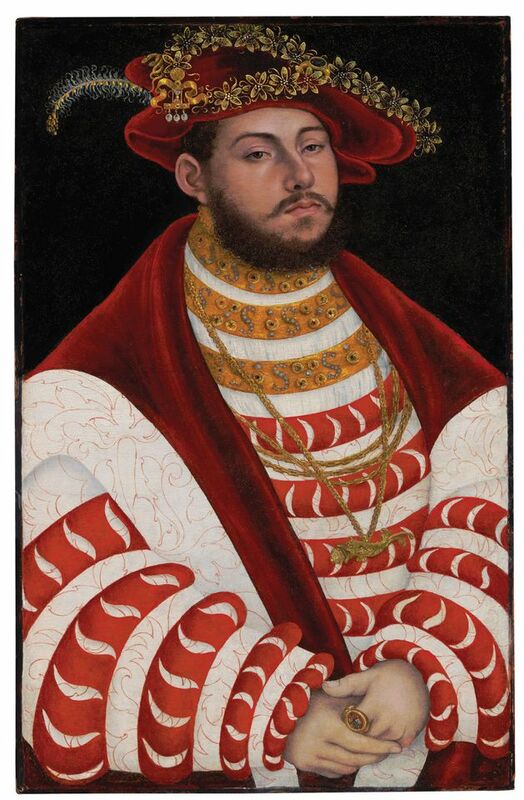 Lucas Cranach the Elder’s portrait of John Frederick the Magnanimous was the one painting stolen from his grandparents that Simon Goodman thought he might never recover. “It had completely disappeared,” says Goodman, who has spent 23 years searching for objects looted by the Nazis from his grandfather Fritz Gutmann, an illustrious Jewish banker with a vast art collection. But the masterpiece miraculously surfaced in a private collection in the US recently, and will be offered for sale on 19 April at Christie’s Old Masters Auction in New York. The auction house negotiated a confidential settlement between the current holders and the Goodman family. It is estimated to fetch between $1m and $2m. John Frederick (1503-1554) was the Elector of Saxony, a friend of Martin Luther, a fervent advocate of the Reformation, and Cranach’s patron. Further portraits of him by the artist are housed in London’s National Gallery, the Louvre, the Weimar palace museum and Berlin’s Gemäldegalerie. Gutmann acquired the painting in 1922 for his palatial home 20 miles west of Amsterdam. His world-class collection comprised works by Botticelli, Guardi, Degas and Renoir, as well as porcelain, antiques, furniture and silverware. He was a particular fan of German Renaissance art and the portrait of John Frederick hung in his red damask-lined smoking room. After the occupation of the Netherlands in 1940, the Gutmann collection was plundered and many works were acquired by Adolf Hitler and Hermann Göring. Gutmann was killed at Theresienstadt and his wife Louise perished at Auschwitz. Christie’s said in a statement that the painting’s “exact path after 1940 is unknown”. For almost eight decades, it was only known to the art world from black-and-white photographs. The terms of the settlement negotiated by Christie’s are confidential, and the identity of the current holder may not be revealed. Francois de Poortere, head of Old Master paintings at Christie’s, said the work had been brought to the auction house’s attention by “people who wanted to do the right thing and reunite the painting with its rightful owner”. One of the individuals involved in returning the work had become aware of the Cranach’s past by reading Goodman’s book about his quest to recover his grandparents’ art, titled The Orpheus Clock: The Search for My Family’s Art Treasures Stolen by the Nazis. Goodman says he has recovered about a third of his grandparents’ collection, but “the more I work at this, the more I discover how much was taken from us”. He is still seeking at least 20 paintings and hundreds of antiques, pieces of porcelain and furniture, and has claims pending with a number of museums. “I am passionate and determined,” he says.